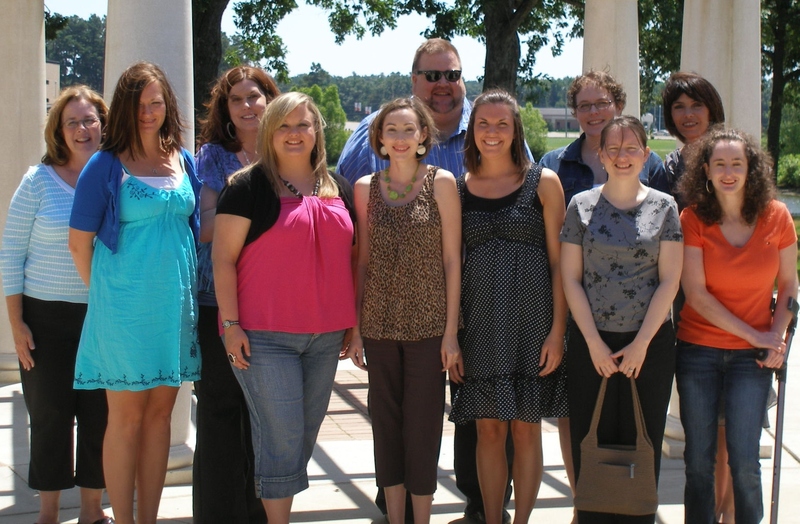 July 6, 2010 -- The Arkansas Delta Writing Project completed its second Summer Writing Institute for Teachers on Friday, July 2. 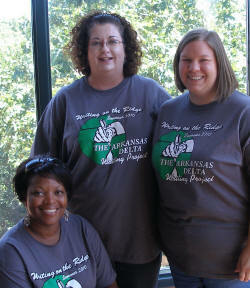 The four-week summer writing institute was held at Arkansas State University in the Department of Teacher Education. Worth two graduate courses in the Department of Teacher Education, the institute requires an application process, an interview, and the presentation of an interactive demonstration lesson. Participants in this year's Summer Writing Institute for Teachers were, from left, Peggy Gipson, Beverly Campbell, Shelly Eichman, Crystal Micheli, Star Martin, Tim Bennett, Jodi Hancock, Melanie Corbett, Teri Spillman, Amy Walton, and Kerri Bennett. This year, two educators joined Dr. Dixie Keyes as facilitators of the intensive writing workshop. Trina Walls, a fifth grade literacy teacher from the Nettleton School District and Carolyn Ponce, a music appreciation instructor at ASU, led journaling events, writing marathons, and guided the creation of an institute website. The facilitators and the fellows produced and published two major writing pieces, along with various poems. Keyes commented, “The core of our summer writing institute is always the demonstration lessons created by the fellows. Teachers learn from other teachers, and the National Writing Project believes in providing the time and space for such a community of educators to gather and to dialogue about and showcase what they do each day." The culminating events of the institute included the publication of a print anthology and an afternoon Poetry Café read-aloud event. Writing to reflect, writing to learn in content areas, writing to publish, and creative writing were all experienced over the four weeks. All of the writing and learning events from the institute were designed so that teachers of writing and other content areas can experience writing themselves. National Writing Project research states that writing project teachers’ students simply write more, and writing more raises student achievement. A recognition and recruitment drop-in event was held on Friday, July 2 in the Spring River Room of ASU's Reng Student Services Center/Student Union for participants' family members, friends, colleagues and administrators, who were able to stop in, enjoy some appetizers, and see the featured achievements of the summer writing fellows. This event also promoted the recruitment of ADWP fellows for the summer of 2011. All teachers, kindergarten through college, in any content area, are invited to apply to next year’s summer writing institute. For more information, visit the Arkansas Delta Writing Project online, or call Dr. Dixie Keyes at (870) 680-8065.